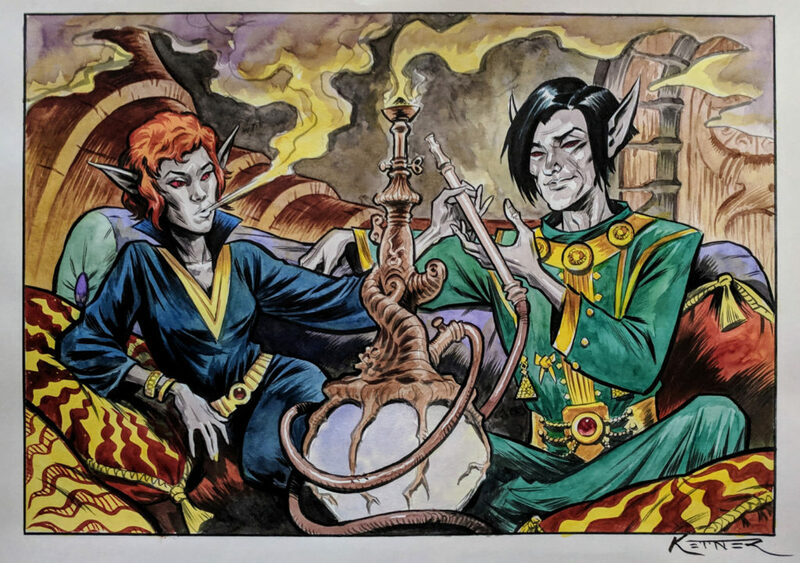 I commissioned Lukas Ketner to draw the scene of Steen and Aryon smoking and chilling and “researching spells,” and ho-lee crap he knocked it out of the park. The style is fantastic. I absolutely love the old-school Dungeons & Dragons vibe, it brings me right back to my childhood when I would spend hours flipping through the AD&D Monster Manual. It perfectly suits eccentric wizards in their weird mushroom towers. Each detail is more amazing than the last – I especially love how the hookah design echoes Telvanni architecture, that’s a nice touch. This entry was posted in Art, Gaming, Videogames and tagged Master Aryon, Morrowind, Telvanni, The Elder Scrolls. Bookmark the permalink.